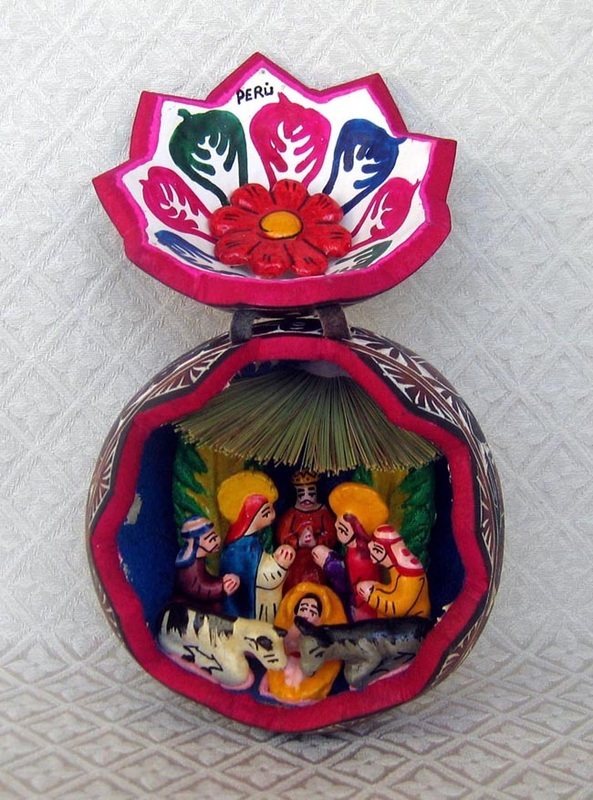 This is a hand-carved maté gourd with a Nativity scene placed inside, called a retablo or diorama. The scene includes Jesus, Mary, Joseph, a king, and two Andean men with a cow and a donkey. The little figurines are made of clay and hand-painted. On the outside of the gourd is a carving of an Andean woman and man with their herd of llamas. The two gourd halves are held together with leather hinges. The gourd was purchased in Lima, Peru. The gourd measures 4.5 inches tall by 5 inches wide. Gourds are available in a variety of sizes, so artisans usually contract with growers for a certain approximate size in the sowing season, October. After harvesting, the gourds are sun-dried for about six months so they are ready to be worked the following June. The coloring on the gourd is obtained by a pipe, made from hollow eucalyptus branches, being put in a fire. The artesano then blows air through the hot pipe to scorch the gourd, creating beautiful patinas on the outer surface. Later, the gourd is intricately carved using typical woodworking tools.